Michelle Rakar's Art Cave: More Birthday Presents! So for my brother's birthday yesterday, I made him some stuff! First of all, I ordered a wristband from wristbandcreation.com for him. It says The Nays and I uploaded a picture that I drew of The Gek to go in the middle, so it can closer look like our logo. I think it came out pretty good, too! I might need to change the font in our logo to look kind of like that, because I really like how it looks together. 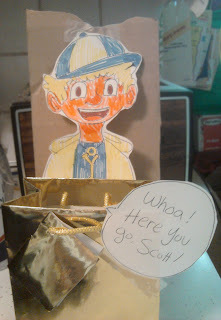 And then I also drew Topaz and decorated the bag that I put his presents in. Annnnd lastly, this was the video I made for him. It took about 6 hours to make, but it was a fun experimental project. Topaz and Grant have been pretty main recently, so I decided this would be pretty appropriate. That kid that is shown with Thing is his new "brother," DeVonne. I hadn't drawn him until this video, but he is a pretty new character in The Nays. I wanted to do a lot of experimental stuff with this one. And I also related it a lot to some of the recent happenings in The Nays, and kind of trying to tie in some of the recent Nay Events, too.